You should create a quiet space to know God. This world can pretty much drown out any knowledge of the Holy. A quiet place reassures you that He lives. A quiet place also reassures you that God cares about you personally. 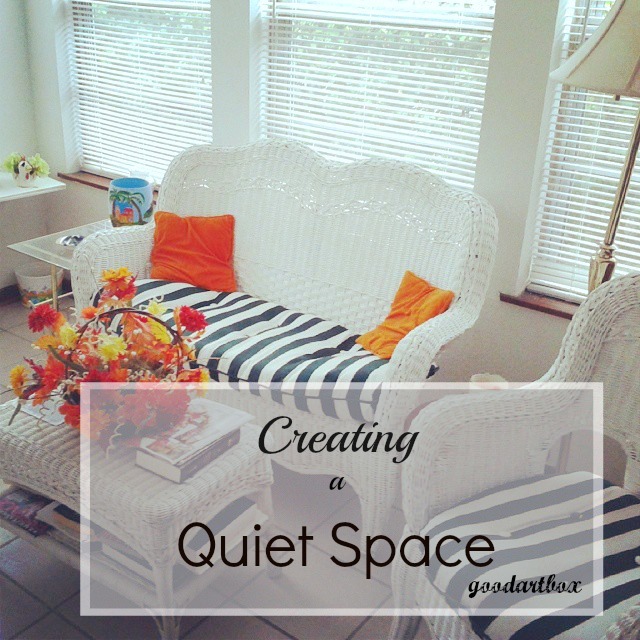 You can create a quiet space anywhere in your home. Whether you live in an apartment, studio or living with a relative, creating a space of solitude can be rejuvenation for your life. 1. Your night table can serve as a quiet space right next to your bed. .You could simply add a Bible and a few inspirational books as well as pen and paper for notes. When you awake in the morning, you are already in your quiet space! 2. Your patio can also serve as a quiet space. Nature is a wonderful place to be when you want to get quiet and a patio is usually outside. Adding a few plants and a small table for your Bible and a few books will lend to a peaceful place. 3. A chair in the den can also serve as a quiet space. The thing about using a family den is getting in the space early in the morning before anyone else gets up. 4. The breakfast table or the dining room can also be used as a place to retreat to to have a few moments of solitude. 5. Dad or mom's office can turn into a quiet space. Sometimes the family office works as a good quiet space...you just have to turn off all the computers and gadgets and stuff.